The pottery class was lovely! Lots of things were fired and I actually like them enough to consider them for the dollshouse. The lighting isn't great because it is definitely blue and white, not the almost black and yellow in the photos. I'll try again during the day, I was just too excited with the results, so this will have to do. 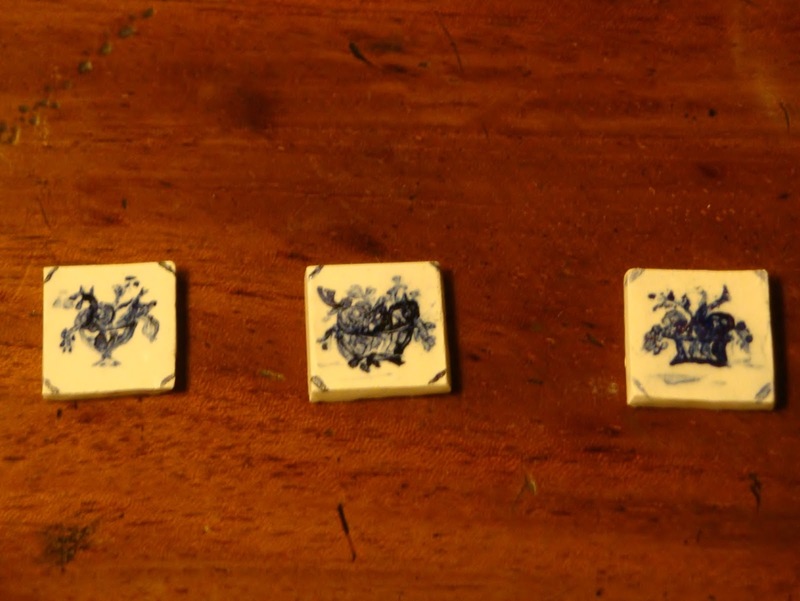 These tiles are for the kitchen, it's turning into a rather Dutch kitchen in my Georgian house, but I'll just have to invent a story to fit how that happened :)). I've made more of the corner tiles, which may be fired soon too. Another 3 on either side and the 4 missing ones in the middle and half a dozen extra, so I'll have a bit of choice! All the finished items put together! 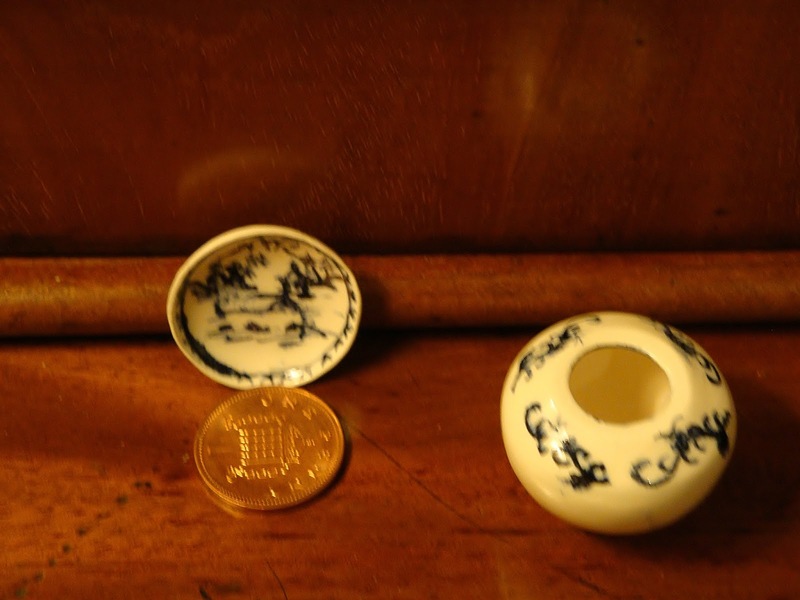 and the vase, which weighs just 2 grams is 2.5cm (1") high and 3cm (1.25") diameter and the best one I've made so far! I've also made a few flower basket tiles, but they don't have a home yet. Wow Idske, dat ziet er superduper uit, prachtig! They are beautiful, Idske, I love your plate and vase. Wauw, wat zijn ze mooi geworden, Idske, écht priegelwerk. De vaas en het bord zijn ook schitterend. Je mag van mij vaker naar pottery class, als je zulke mooie resultaten mee naar huis brengt :D! Ja, hoe zal die Hollandse keuken nu in jouw huis terechtkomen?? Het zal me benieuwen wat voor verhaal je hiervoor brouwt :D! Hebben wij geen moeite mee, hoor, althans ik niet. What a beautiful tiles. They're perfect ! !The dish and vase are perfect also.Wished there was a pottery class nearby the place I live. Oh Idske, more lovely work! It is so wonderful that you're able to both make the pottery and paint it. The results are excellent again! I just did another porcelain painting class again last Saturday. It is so much fun! I like the tiles. Dish and vase are wonderful. Thank you all for your kind comments! I will try to get better pictures at the weeken! Fingers crossed for some sunshine here, it's very grey and gloomy at the moment! Fantastic Idske, how do you manage such tiny decorations. Me encantan esos precioso trabajos. Thank you Ascension, and welcome to my blog! I`m sure it will be so nice to have tiles in the house, that you have made yourself. Everything looks perfect. Beautiful work! Everything is just perfect! Thank you, Lucille. I've not succeeded in taking better pictures. Still waiting for brighter weather! Idske wat een ontzettend mooie tegels en vaasjes heb je gemaakt, echt super!